Did you know that Nicolas Cage has never played a part on any TV show, ever? That boggles my mind. I’m sure it’s probably true of a lot of movie stars, but it’s sort of amazing to me that he never stumbled into a TV part, especially early in his career. Best of Times is a 1981 television comedy film directed by Don Mischer, intended to be the pilot for a series. It is also the film debut of Crispin Glover and Nicolas Cage. This ABC pilot starred 7 teenagers in a 80’s style Laugh-In. It told the light and dark side of teenage thoughts with dancing and singing added in for color. It would have done wee in a Saturday morning slot( think saved by the bell), But, alas, it was put up with the big guys and was swallowed up before it even had a chance. Bummer!. Can you imagine! 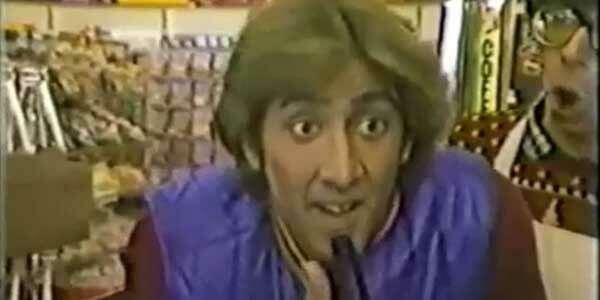 We almost lived in a world where Nicolas Cage was a TV star. Instead, the pilot wasn’t picked up (or something?) and Cage went onto become the movie star we love. Best of Times is one of two Cage movies that isn’t available on DVD or Blu-ray (the other is Never on Tuesday). It is, however, available on YouTube in its entirety. As Cage’s first film, this is the first one Mike and I will be watching this fall. I think I’m going to get creative and burn the VHS rip from YouTube onto a DVD and watch it the way Cage intended. I just need to get creative with the box art (for this and Never on Tuesday, which I need to get creative with, or just buy the VHS) because there are basically NO high-quality images from the pilot online. Either way, Best of Times gave us this GIF, which is all we need anyway.